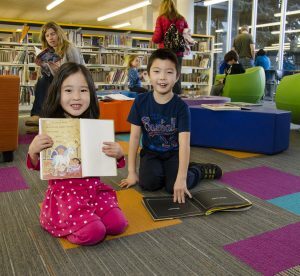 Over the last few months, I have been outlining the reasons behind the Commission’s recommendation for the formation of a Library District (Learn more). This month I would like to highlight what would be different if our library could rely on secure long-term funding. Libraries help communities develop to their fullest potential, let’s invest in ours so our community can continue to thrive. Currently, Boulder Public Library is operating at maximum capacitary on minimal resources, welcoming over 1 million users in 2018. Our Library is consistently one of the busiest public spaces in Boulder, and yet our library is essentially operating at 2002 funding levels. What’s more, library staffing has decreased by 16% since 2002. The long-term effects of operating on stretched funding is evident in the staff’s workload, under-maintained facilities, and waitlists for popular materials, classes and programs. A new full-service library in North Boulder, without compromising services and staffing at any of the other branches. A new corner library in Gunbarrel and some form of library services to areas outside of the city, with adequate staffing levels. Expanded hours and service capacity at Carnegie Library for Local History, which is currently operating at a reduced capacity. All Library facilities would be repaired and maintained, and the maintenance backlog would be addressed. A materials budget of $14 per capita for the entire service area would reduce the current long wait times for popular books. Expanded outreach to Latinx, senior, and underserved populations. Canyon Theater renovation and activation for increased public use. The capacity to expand partnerships and volunteer activities. Securing long-term funding would allow the library to focus on the task of running the best library for our community. Expanding the tax base would give the library the resources to serve the current user base to the level requested by the community in the Master Planning process. Please join us in learning more at Funding Our Library Future. Read my January letter and February letter.